It’s probably a pretty safe bet to say that anyone who has a double DIN opening in their dash would like to put a cool DVD touch screen headunit into that spot. But, you may have noticed that the vast majority of these units are priced somewhere between 600 and 1200 bucks (US), which makes them pretty difficult to attain for those of us on a budget. That is, until now. 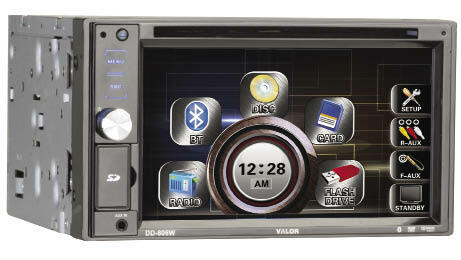 From the folks at Valor Multimedia comes the new DD-806W, a double DIN multimedia unit with a 6.2” TFT color touch screen. And the best part is, the DD-806W retails for a paltry $389.00 here in the U.S.! At that price, you know we just had to take a closer look. 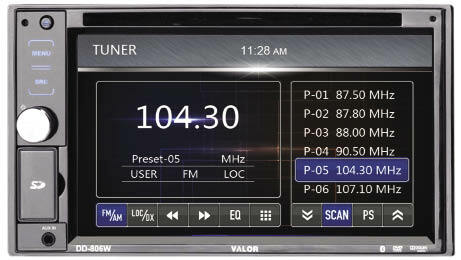 The Valor DD-806W comes with a pretty full list of standard features. The unit boasts a 6.2” TFT LCD touchscreen with 800x480 resolution, USB 2.0 connectivity supporting up to 500Gb, plus an additional 32Gb of SD memory card support. With Valor’s ACC-iPAVCB (sold separately) you can connect your iPod, iPhone or iPad to watch video and listen to music through the front or rear auxiliary. Bluetooth connectivity is built in as well, for easy hands free operation of your Bluetooth enabled phone. The CD/DVD mechanism will also play back MP3, WMA and AAC formats, and a built in Dolby Digital decoder provides surround sound decoding. The high performance AM/FM tuner has 40 FM and 40 AM presets, and an onboard DSP processor provides various preset EQ curves, as well as the ability for the user to adjust things themselves. There are dual audio/video auxiliary inputs, one set on the rear for more permanent connections, and another set via a front mounted 3.5mm input, for convenient temporary connections. A rear monitor output is included as well, to send video signal to a rear seat mounted monitor. In addition to all that, the DD-806W also sports a rear view camera input, and programmable steering wheel control inputs. On the audio output side of things, the DD-806W comes with a built in four channel amplifier and a fan cooled heatsink, and pre-outs for Front, Rear, and Subwoofer amplifiers. A wireless remote control is also included.